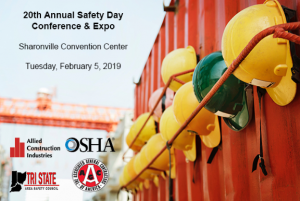 Fulcrum Lifting will be exhibiting at the 20th annual ACI/OSHA Safety Day! Stop by and see what’s new from Tri-State Wire Rope & Fulcrum Lifting including demos and new products from Enerpac. OSHA and ASME standards are put in place to insure a safe working environment for each of your employees and the commitment to safety is here to stay. We encourage you to attend this event and similar events in your area and, as always, we are happy to assist you with your rigging safety needs.